Arriving at the Spring Peeper Meadow parking lot, I view a prairie tableau: grassy expanse, bur oak, anise hyssop, and a female brown headed cowbird on fence post. Early mornings are good times to visit prairies and wetlands – especially on a day when a heat advisory is forecast. Even at 71 degrees Fahrenheit, dew on the grassy paths soaks the toes of my shoes. Birds are active this morning. Swallows are flittering and gliding overhead, occasionally swooping downward in search of the insects – which appear abundant based on my observation of nearby plants. Red-winged blackbirds are chattering – but escape my photography. Only after I pass to they return to the plants flanking the paths. 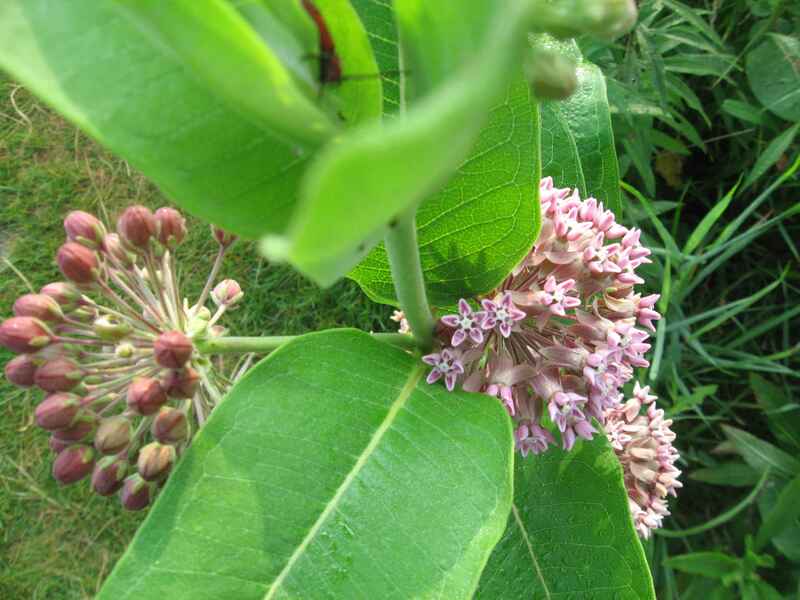 In bud just two weeks after my last visit to Spring Peeper Meadow, showy milkweed is now reaching full bloom. On this early morning, their fragrance is faintly present. In the full soft heat of midday, their bouquet would be more obvious. Besides birds, flying points of interest include the common mosquito – undaunted by my insect repellent and an elusive monarch. A single bumblebee reminds me of a recent radio story on the overall health of bumblebee populations. New evidence seems to suggest that the earth’s changing climate is threatening. Bumblebees are quite furry – and that suits them well in the cool weather of a late spring afternoon or a mild summer morning. As overall temperatures rise, one would hope that the bumblebee could expand its range northward. However, arboreal forests do not offer the flower nectar sources of the prairie. 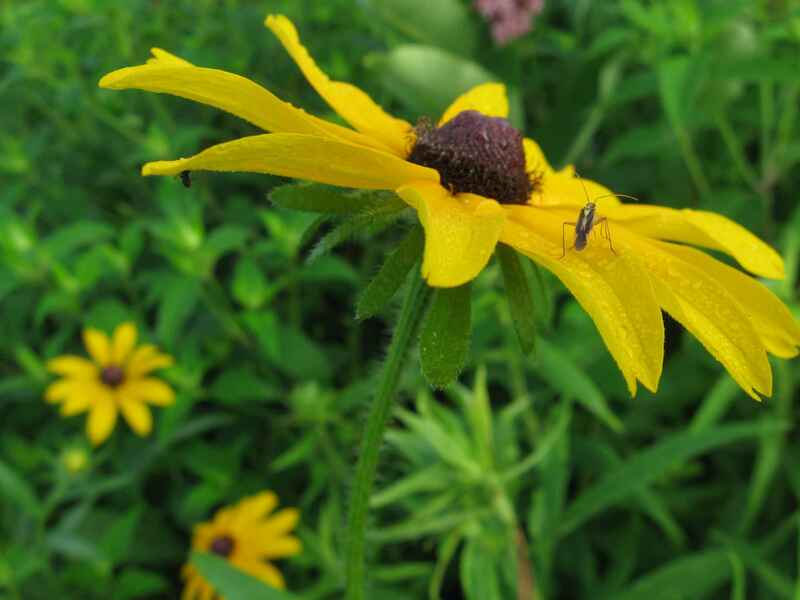 Speaking of prairie blooms, Black-eyed Susan is one of the several yellow flowers now coming into bloom. At least two different insects feast on the flower. Cup plant holds its yellow blooms aloft. Among of forest of cup plant stems, rosin weed flowers nestle. Aphids cover the stems of nearby goldenrod stems; and many stems display galls – tell-tale signs of insect habitation. Another gall-like sign of an insect “nest” is the deformation of the growing top of a cup plant. On the plant stem, the name-sake “cup” is formed opposite clasping leaves that are pierced by the plant stem – “perfoliate” is the official term. 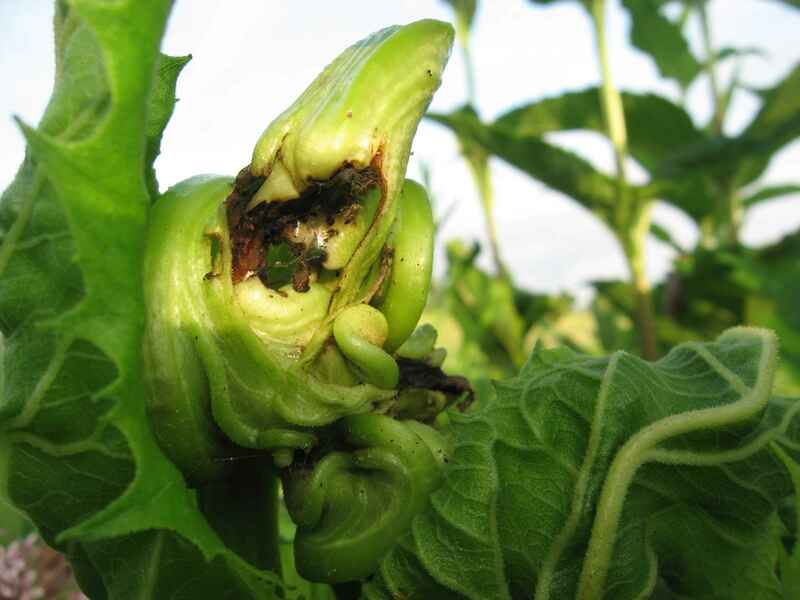 But at the tops of several plants, leaves and stem are tormented and twisted. Furthermore, evidence of a dramatic exit marks the side of the gnarled mass. Nature offers insects a creative means of inducing a plant to form – or deform – a protective shelter for insect “young’uns” – protecting them from predation. I turn to return to the parking lot. An overview of Spring Peeper Meadow includes sweeping waves of different grasses, and in the foreground, common prairie plants: showy milkweed, cup plant, and goldenrod. Venture forth and explore the fleeting nature of the plains.